ITECH Power Supplies ! !Special Offers!! As a professional global power electronic instruments manufacturer, customer orientation is the principle of all of ITECHs activities. ITECH have been devoted into research and development of Power Electronics for decades. By continuously understanding the testing needs of various industries, ITECH continues to provide users with competitive testing solutions. ITECH has become a fairly large scale power electronics test solution and equipment supplier with a wide range of product lines. ITECH is committed to product innovation, in hope that innovative products not only meet the users general test needs but also allow users to have new experiences through unique test technology and convenient software applications. IT6000B integrates bidirectional power supply and regenerative electronic load into one 3U unit. It is also a very powerful one. Only a button is needed to switch between the bidirectional power supply and the regenerative electronic load. It can be used not only as a stand-alone powerful bidirectional power supply, as a source to provide power; but also as an independent regenerative electronic load, to absorb the consumed energy and feedback cleanly to the grid. The bi-directional programmable DC power supply of IT6000C series combines two devices in one: a power supply (source) and an electronic load (sink) with energy recovery. Based on these two functions, IT6000C offers the functionality of two-quadrant operation. The regenerative capability enables the energy consumed to be put back onto the grid cleanly, saving costs from energy consumption and cooling, while not interfering with the grid. Built-in waveform generator supports generating arbitrary waveforms, and import LIST files for waveforms via front panel USB port. Single channel output programmable DC power supply, is applicable in laboratories and automatic test system to provide high-power and stable DC supply. IT6100 series come with 0.1mV/0.1mA high resolution and high accuracy to ensure accurate measurements. Its voltage rise speed goes up to 20ms and with the high-speed list mode output, it can independently edit and output default voltage waveforms to meet high-speed test needs. IT6100 series supports the SCPI communication protocol via optional communication interfaces(GPIB/USB/RS232). IT6100B series (86 ~ 1200W) high speed high precision programmable DC power supplies provide ultra-high voltage rise times, a resolution of up to 0.1mV / 0.01mA. The latest output waveform priority mode allows rising waveform of voltage or current with a high-speed and no overshoot. IT6100B has built-in standard USB / RS232 / GPIB communication interface. 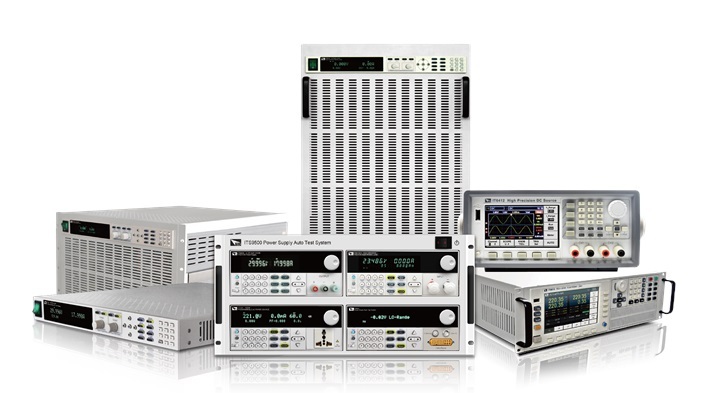 IT6300 series high-performance programmable triple channel DC power supplies. Each output voltage and current can be set from 0 to the maximum rated output value. This series supports series/parallel connection and synchronous functions of the channels which offer multi-purpose solutions for customer tests. The unique bipolar voltage/current output makes IT6400 series usefull as a bipolar power source or a bipolar electronic load. The battery simulation function is especially applicable for development and high speed production testing of portable, battery-operated products. IT6400 series can be widely used in portable battery-operated product tests, mobile power pack tests, LED tests and other fields. Ranging from 800W to 30 kW, the whole IT6500 series include more than 100 models. The maximum output voltage and current is up to 1000V and 1200A respectively. IT6500 series not only includes rich measurement capabilities, high-speed response IT6500C series but also provides high-performance, stable output IT6500D series so that the user can easily select according to demand. Supports setting up/down speed independently in different operation modes (Power supply: CV/CC/CP modes, Electronic load: CC/CP modes). Adjustable rise and fall time. IT6700H series high-voltage DC power supplies with a voltage of up to 1200V. IT6700H series have a desktop and shelve installation function for easy operation. IT6700H series provides a list mode, built-in RS232 / USB / GPIB communication interface and rich SCPI instructions to facilitate the formation of a variety of intelligent test platforms. IT6800 single channel programmable DC power supplies (180W-216W) with resolution of 1mV/0.1mA where users can adjust the voltage/current stepping by pressing the left and right keys to move the cursor and programs on the front panel. IT6800 supports timer functions and has built-in RS232 and USB communication interfaces. The IT6900A series are flexible range single output power supplies with an easy-to-read VFD display, high accuracy and resolution up to 1 mV / 0.1mA. It allows to generate and store programmed sequences directly from the front panel. The IT6900A is a compact laboratory grade power supply and well suited for application in design field and production or use in university labs. IT7300 series single-phase programmable AC power supplies can simulate various normal and abnormal AC inputs and measure important electrical parameters of the DUT. IT7300 series can be widely applied in the electronic and electrical industry, lighting, aviation, military, specification/verification of RD, laboratory testing and factory production online test etc. IT7600 series high performance programmable AC power supplies, adopt advanced digital signal processing technology, with adjustable frequency of 10-5000 Hz, power of up to 54 kVA, built-in all-round power meter and large-screen oscilloscope function. They support master-slave parallel mode. IT7600 can be widely used in many areas, such as renewable energy, home appliances, power electronics, avionics, military, development and application of IEC Standard test and so on.